I feel like the last person in Melbourne to make it to Hellenic Republic. I’ve also never eaten at the Press Club. *shame* And, after the whole George Calombaris hating on the bloggers, I wasn’t rushing out to try them. However, the promise of feta at breakfast time was enough to convince me and we finally made it there last weekend in the middle of the stormy weather that had our roof leaking and anxiety levels high. 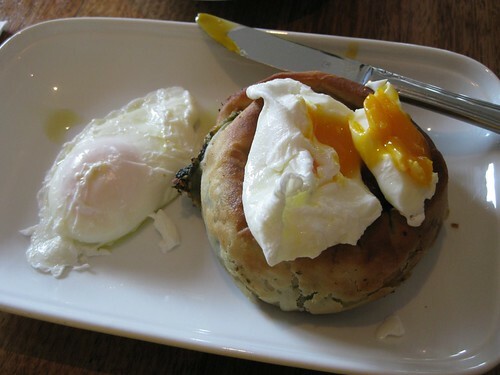 Tash had been raving about breakfast at Hellenic Republic since she moved to Melbourne a couple of months ago; she and her housemate had gone one morning and all I’d heard since was “breakfast spanakopita”. 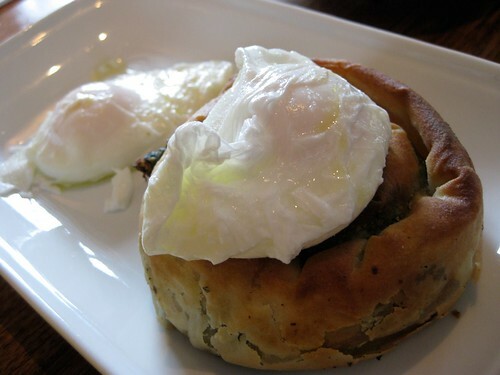 Never one to shy away from filo at breakfast, I was intrigued and excited to check it out. Fast forward, two months and we had finally made a date to go and eat. The menu isn’t huge and it is the usual breakfast stuff with an interesting spin on it. I had already decided I was having the spanakopita but I was also interested in the omelette with feta, leek and potato and, if I ate meat, I’d definitely try the breakfast souvlaki. Tash had tried the omelette before and loved it but one of her Perth friends had tried it the week before and found it a little bland. I will have to go back and try it myself soon. Tash also had the spanakopita because she’s an addict. Esther had a very simple but very delicious breakfast of sourdough, spreadable feta, avocado and tomato. I’ll be honest and say that it didn’t look that exciting to me but Esther assures me that it was lovely – the avocado nice and ripe, the tomato well seasoned with good olive oil and pepper and the feta was outstanding. She was very happy with her choice and I think if I was in the mood for simple or light (for a certain value of light), this would be my choice. And then we shared breakfast dessert because that’s how we roll. 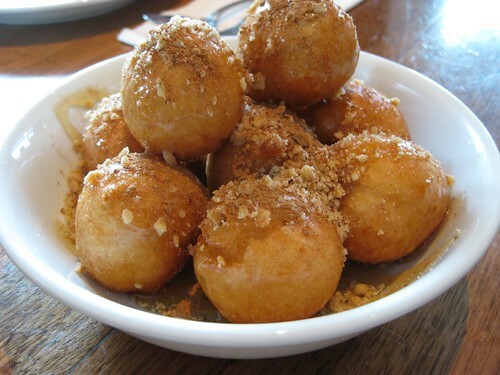 Greek doughnuts with honey and walnuts. Amazing. 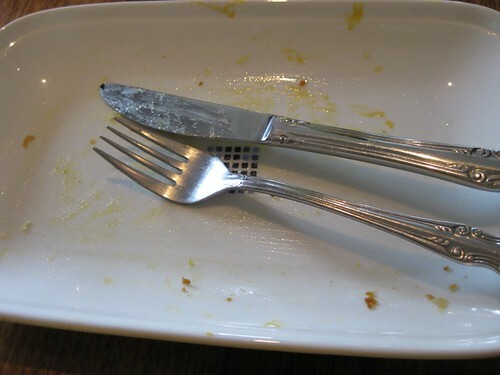 So, all in all, I really enjoyed it – the food and coffee were excellent, the service was great and the atmosphere was nice. It is a bit more expensive than our usual breakfast haunts but I think it was worth it. Also, George, I’m sorry if my unsophisticated palate and amateur review isn’t good enough for you. Oh, peeps. Cannoli! One of my loves at Brunneti! One of my loves pretty much anywhere! This month I got to make my own and the results were . . . mixed. After my last minute panic baking the last couple of months (which resulted in me not participating or not having time to give things a try if they didn’t work 100%), I scheduled a baking day as soon as we had received the assignment. BEST LAID PLANS. I chose a day towards the middle of November, little knowing that we would have a heat wave. 38C + deepfrying didn’t work for me so I postponed. Then it was Esther’s birthday and I had birthday cake to make. Then I had work, volunteer and social commitments every single day for the rest of the month. Finally, on Sunday night, as I was busy cooking up things for dinner with friends on Monday, Esther suggested making the dough so it would be ready to fry up when I got a chance. Genius woman! 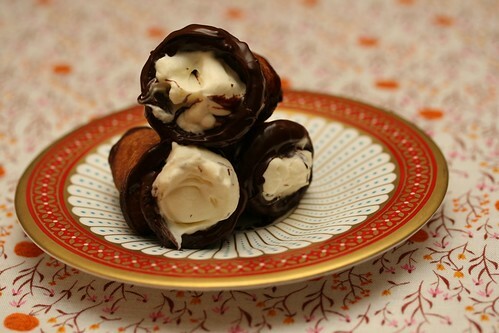 I made a rose and vanilla cream to fill them with, melted some chocolate and put it all together. They were delicious and fun and I may make them again one day when I have learnt how to roll dough properly. On the weekend, it was my lovely girlfriend Esther’s birthday! Hooray! Even though we went out to high tea with a bunch of friends and there was more cake than you could poke a stick at, I still declared that you cannot have a birthday without a homemade cake and any thoughts to the contrary were a travesty. So, a week ago, we sat down with How To Be A Domestic Goddess and Feast to start the labourious task of choosing a cake. 1. S-J to read out likely looking cake names from the book. Esther to register interest in certain cakes. Shortlist created. 2. S-J to show pictures of shortlisted cakes to Esther. More cuts made. 3. S-J to read out Nigella’s description to Esther. More cuts made. So, you see, birthday cakes are very serious business. 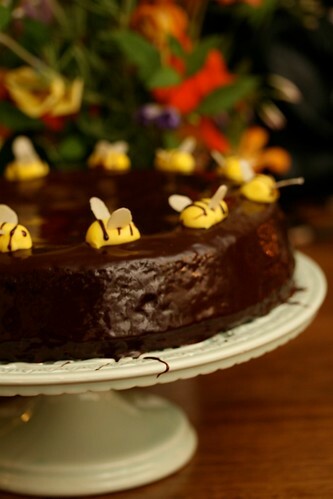 Esther chose Nigella’s Chocolate Honey Cake from Feast mainly, I think, because the bees on top were so cute. She does love honey though so it might have been a combination of factors. There was going to be more rounds of voting as I brought in my 195 delicious bookmarks but there was a clear favourite from the outset. This was a lovely cake to make – it was fairly easy and not particularly time consuming. The best thing about it was that it filled the house with a lovely rich honey smell which was delicious. My only issue was the top of the cake catching a bit but I think that had more to do with the FrankenOven and me upping the temperature a bit to compensate for the lack of insulation of the oven and Nigella did warn against it. After about 30 minutes, I put some aluminium foil over the tin and it was fine. It wasn’t noticeable at all in the final product so hooray! To me, this is one of those infuriating cakes where you have to let it cool completely before glazing which is just epic baking mocking in my book – the cake is there but don’t eat it! I wasn’t entirely sold the glaze until I had a finished piece of cake (why yes, I did dip a spoon into the glaze to . . . test it). 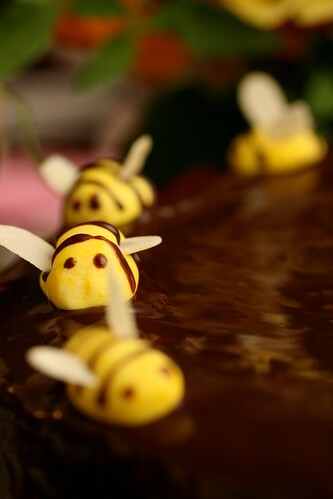 The bees were made by the birthday girl herself who is supremely talented at the fondant-related crafts. This cake was seriously delicious – the cake somehow managed to be cakey & dense and light & smooth at the same time. It was rich but not so rich that you rub your tummy and cry afterwards. And, most surprising to me considering the quantitiy of honey, the honey flavour was very subtle and added a lovely note to an outstanding chocolate cake. Well done, Nigella. Preheat the oven to 180c and butter and line a 23cm springform pan. Melt the chocolate in the manner you prefer. Leave to cool slightly. Beat the sugar and butter until airy and creamy and then add in the honey. Add the eggs one at a time, with a spoon full of flour in between each egg. 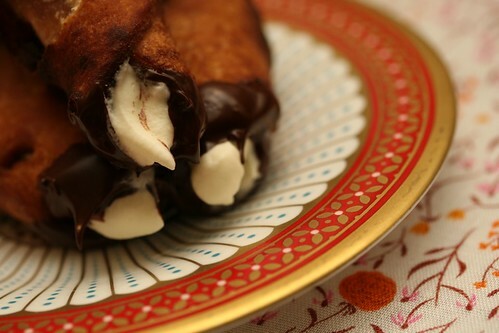 Fold in the melted chocolate, the rest of the flour and the bicarb. Add the cocoa and mix. Scrape down the sides of the bowl and then (carefully) beat in the boiling water. Mix well and then pour into the prepared tin. Cook for an hour but check regularly and cover with foil if it catches. To make the glaze, bring the water and honey to the boil in a smallish saucepan, take of the heat and add the chocolate, swirling it around so it melts. Sieve in the icing sugar and whisk until smooth. When the cake is cold, pout the glaze over the cake and smooth it down the sides. It takes a while to set so prepare at least an hour before you want to serve it. 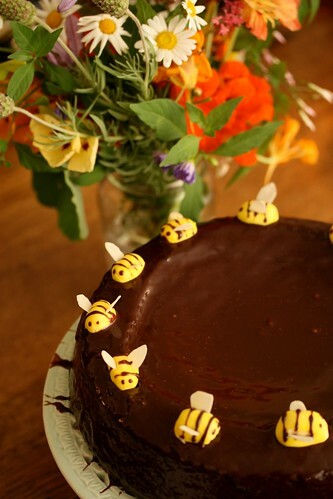 To make the bees, add some yellow food colouring to the bee makings of your choice and mix in. Pinch a little bit off and roll into a little sausage. Use a skewer to paint on some stripes of left over glaze (and eyes if you wish). Use the flaked almonds to make wings. EAT AND ENJOY! OM NOM.